At the height of her career, Cheryl was a case manager working for a mental health agency in Juneau, Alaska. She had two degrees from Northern Arizona University under her belt -- in sociology and psychology. She was extremely knowledgeable in dealing with domestic violence issues, substance abuse and working with at-risk youth. In fact, she was so passionate about helping the most vulnerable in her community, she was also a foster parent to at-risk children. But like many residents living in Juneau, over the years Cheryl began to suffer from Seasonal Affective Disorder (S.A.D. ), a type of depression that’s related to seasonal changes. In Alaska specifically, residents suffer from the low amount of natural light during the long winter months. Types of treatment for this type of depression include light therapy or geographic relocation. Cheryl started treatment for S.A.D. but unfortunately, her symptoms, including anxiety, apathy, mood swings, and manic episodes, had already started affecting her work. She found it harder and hard to keep up with her normal work hours and ultimately, she lost her job. Determined to continue on, Cheryl quickly found a new job as a wellness coordinator at the University of Alaska. But her severe symptoms of depression only worsened and she wasn’t able to stay at this job either. The cycle repeated with another job, until Cheryl decided to make a major change. She moved back to Arizona with her son. At the time, she knew this was the right decision, as her mother and both sisters lived in Phoenix. She had no idea of the tumultuous times that were ahead of her. After a year of searching, Cheryl found a niche job in her field that seemed to be just right for her. She helped a local organization provide grant money to social service agencies. She even found that her manager was very understanding of her mental health issues. Cheryl was making ends meet, but barely. Then she began suffering from physical health issues – chronic obstructive pulmonary disease (COPD) and a pinched nerve in her neck. Her medical bills began piling up and, like many who live check to check, Cheryl lost her apartment. A month later, she lost her job. She and her son began staying with family and friends temporarily until she could find another job. She looked for a new job for over a year with no luck, all the while struggling more and more with her mental and physical illnesses. Finally, Cheryl decided she needed permanent help and filed for disability. She and her son were living with her mother at this point, both sleeping in the living room. But her mother’s landlord would only allow one extra person to live in her small house. Cheryl told her son to stay and she would figure out where to go. With no income or savings, her only option was checking into a shelter. “I literally went from middle-class America to a homeless shelter. I had nowhere else to go at that point. I was in shock,” she says. Because of her severe health issues, she was able to get a bed at a local shelter immediately. On her first day there, she began the process of researching and applying for programs that would be able to help her. She began eating breakfast and lunch every day at St. Vincent de Paul’s downtown Phoenix dining room. She was determined to get back on her feet and into her own home again. Unbeknownst to her, things were going to get worse before they got better. After a conflict, she had to leave the shelter and for the first time in her life, Cheryl did not have a bed to sleep in. But her persistence in applying for programs early on finally paid off. Cheryl was accepted in SVdP’s Ozanam Manor shelter. 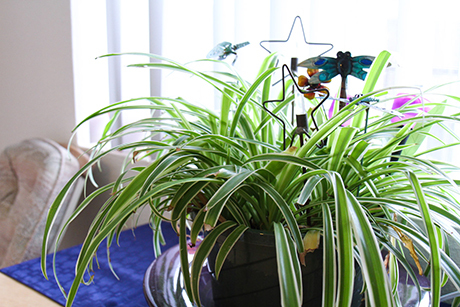 “I was so grateful to St. Vincent de Paul at this point, they had provided me with meals and now, housing,” she says. Cheryl explained that at traditional shelters, residents are required to leave the shelter early in the morning and are unable to return until the evening. So she had to spend her days walking around Phoenix. At Ozanam Manor, she was able to finally stay inside. If she felt sick, which was often, she was allowed to sleep all day. But there was one benefit that Cheryl truly loved about Ozanam. During her stay, Cheryl stayed on top of her health issues, visited her doctors, worked on finding the right medication and filled out the proper paperwork to continue her disability filing process. In February of this year, she left Ozanam Manor and was placed in an apartment through ABC Housing. 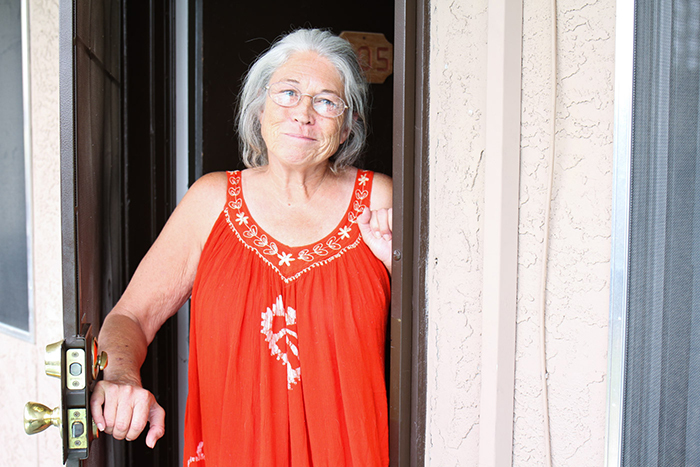 She now lives in a one-bedroom apartment in central Phoenix and has created a cozy home for herself. 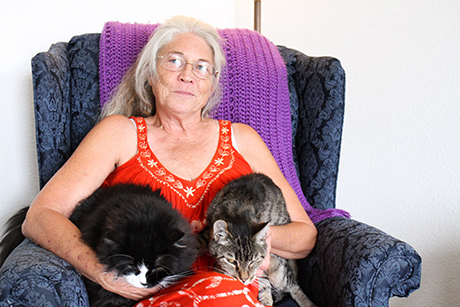 During this long journey, her sister had been watching her cats, and for the first time in years, she got her cats back. Cheryl admits that while she feels so blessed to no longer be homeless, she still faces a daily uphill battle. While waiting for her disability benefits hearing, she has struggled to pay for basic necessities such as shampoo or dish soap. Her family has since moved to another state and she hopes to one day join them.